How to start a 3D printing lab? Our Ebook, including exclusive tips of 5 experts is out now! Opening your own 3D printing lab: to actually make this step requires quite some expertise regarding additive manufacturing. One needs to be well knowledged on material resources, staff, space requirement, 3D printers, funding options, workshops, and fablabs. 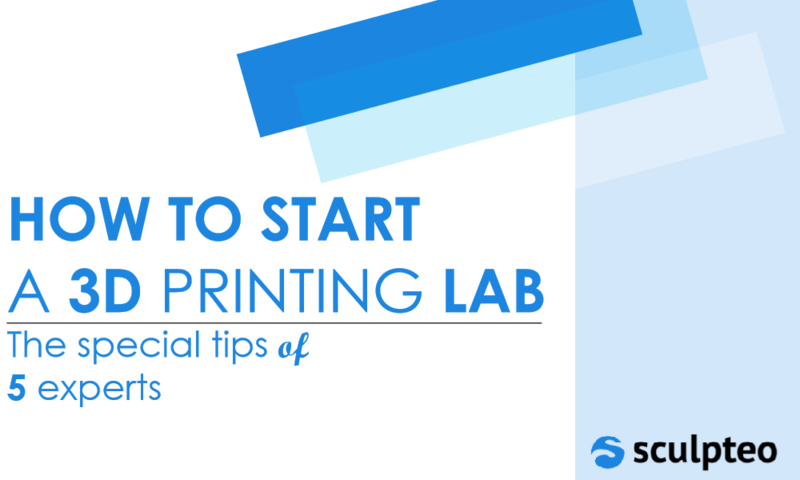 This Ebook will answer all your questions and remove any doubts you have about actually starting a 3D printing lab. Interested? Click on the link to download it for free! Why do you need to be informed about 3D printing labs? Our reasoning behind writing this Ebook has to do with the fact that we truly believe these essential tips that were given to us can be beneficial to the 3D printing industry as a whole. Benefits of having your own 3D printing lab in general are workflow optimization, reduced labour costs and fewer process steps. Instead of letting us do the talking, we will give the word to representatives of companies such as Google, Carrefour Numérique and Techshop. Having your own 3D printing lab could simplify your workflow greatly but in order to do so, you need the right resources. A tool that will help you with this is Fabpilot, a cloud based 3D printing software solution. Fabpilot, powered by Sculpteo is a nifty cloud-based solution for 3D printing software. It integrates project preparation, order management, order production and operations management. You will be able to manage your entire 3D printing workflow with one platform and minimize the cost and complexity of using multiple additive manufacturing software. The Fabpilot cloud software allows real-time performance monitoring and can review 3D models, select 3D printing materials, prepare printing jobs, repair STL files and optimize files for 3D printing. With industry-leading algorithms and design tools, Fabpilot has all the features you need in order to open up a 3D printing lab and to optimize it. You’ll get a complete view of all your 3D printing operations and thus respond to issues before they become possible problems. At Sculpteo, we strive to write about anything and everything related to additive manufacturing. We have our very own 3D printing blog where we write about topics concerning the corporate use of additive manufacturing, general design subjects and the latest technological advances in the 3D printing industry. How to Design for Digital Light Synthesis (CLIP) technology. The State of 3D Printing, our annual study providing trends in the 3D Printing industry. When you follow us on our social media pages you will never miss the latest news concerning the additive manufacturing industry. If social media is not really your cup of tea, you can subscribe to our weekly newsletter to get your weekly dose of 3D printing.